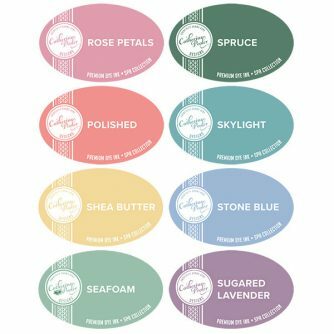 The spa collection of ink pads by Catherine Pooler is another eight soft gorgeous muted colours inspired by a trip to the spa to soothe away all your tensions and make your stamping relaxing. Polished – rich coral hues as found deep in the ocean. Rose Petals – luxurious softly muted pink. Seafoam – is the perfect soft green sea glass shade. Team with Spruce or Eucalyptus for a multi tone look. Shea Butter – silky smooth light muted yellow. Skylight – soft muted green blue shade. Spruce – deep muted forest green. Create an ombre look with Seafoam and Eucalyptus. Stone Blue – soft muted relaxing blue. Team with Seafoam and Juniper Mist layered stamps. Sugared Lavender – soft sweet lavender to soothe your mind.